There are many origami hearts on the internet but this money aligned heart is special because the circle with the pyramid and the circle with the eagle are aligned with one another. The circle with the eagle is the US Coat of Arms. The circle with the pyramid has no official name but the eye in the small pyramid is called “The Eye of Providence” and it’s supposed to mean that God is all seeing. The two circles together are called the “Great Seal of United States”. 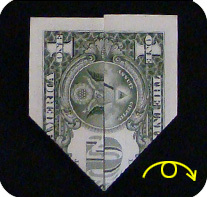 This origami model aligns the two sides of the Great Seal of United States making a chimera of sorts. 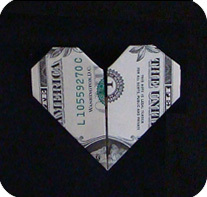 Fold a dollar bill in half crosswise. Unfold. 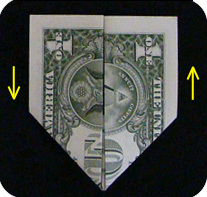 Fold the dollar bill in half lengthwise (bottom to top). 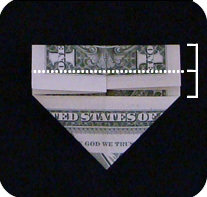 fold up the left and right sides of the dollar bill. 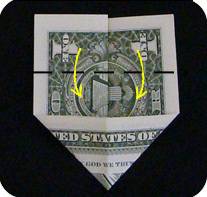 Shuffle and slide the two sides of the money until the edges of the circles (the Great Seal of United States) align. Fold down the top part of the model. One side will be a little shorter than the other side depending on the amount of slide/shuffle made. 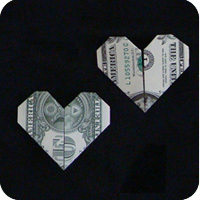 Imagine dividing the top-half of the heart into 2 parts. Using the imaginary line as a guide, fold in the four corners down as shown. Done! Note how the edges of the circles are nicely aligned. 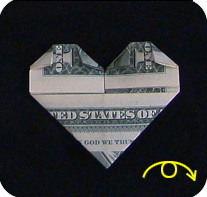 This is how the model would look like if you started with the green-side of the dollar bill facing up. You cannot align the green and black circle but you can align the bottom of the heart so the edges of the portrait of George is aligned.